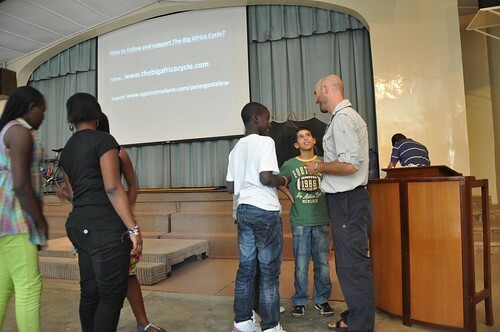 Thanks to Hiromu I was able to get some photos and video clips of a talk I gave at Hillcrest International School here in Jos yesterday. I began the talk receiving a ‘boo’ for saying I felt like I’d been transported out of Africa with my microphone headset plugged in. Fortunately my positive comments about Nigeria won a few cheers back later on. 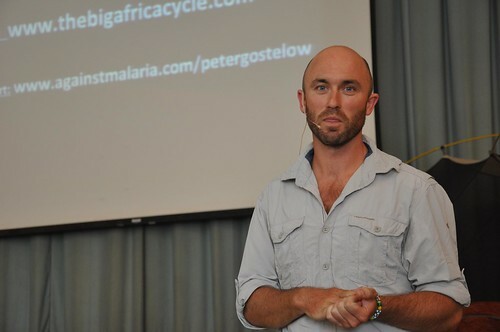 Speaking in Nigeria from Peter Gostelow on Vimeo. Tomorrow the two of us leave Jos and the cool temperate plateau destined for Yankari National Park. Photos of elephants in the next post perhaps? Life back home’s quite okay. I’ve been busy this autumn giving talks (some 40 already, and another 40 coming up this spring) about the RTW-ride, which is great, challenging – and it feels good actually having a proper income for a change. But the wanderlust lurks below the surface. Sure it does. Will write a book about the WT-journey in 2011 and I might “have to” settle down somewhere exotic (Thailand is a fine contender) to find the required peace/inspiration. Sounds like a pretty good escapist excuse, doesn’t it? So great to see you in action after reading your blog for so long! Now I can put a face and voice to your posts. Keep it up! Lovely to hear your voice, thanks hiromu. Hope your audience appreciated your views on their country. @Mum, Thanks for posting a comment here. I think it is the first a family member (after Grandpa) has done so. Spread the word…. It always was – and continues to be – a true delight following your adventure, Peter. Thank you so much for keeping the spirits high, and for sharing (some of) all the moments, thoughts, places you go through. @Nicolai Bangsgaard, Thanks. How is life settling back in Denmark? I still owe Bjorn $20US that he lent me in Iran. Glad to know you’re following the journey.